// If you have any concerns or complaints, I'll gladly take them here. Specifically constructive criticism. I don't expect people to shitpost "VAMP METAGAMED ME~!!!!1one11!!11!". That post will be removed if I see it. This is mostly for OOC complaints, but, you can post IC here as well. Make sure to tag your post as [IC] or something so that we know. Have fun~! 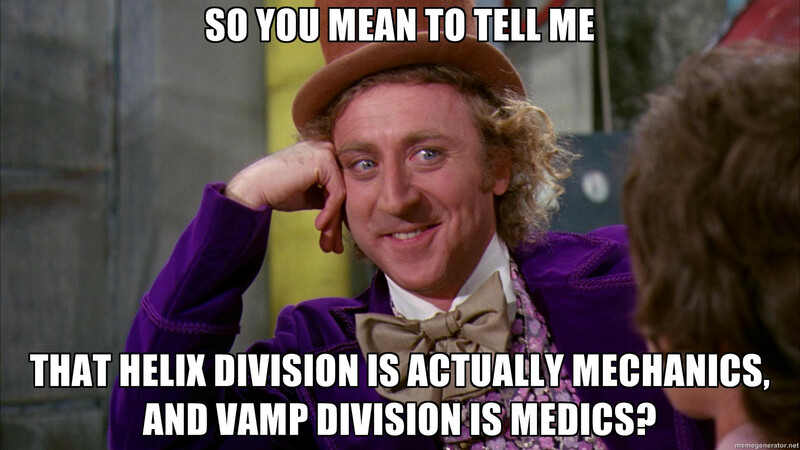 When somebody joined in saw it, they thought it was literally a Vampire Division for taking blood. It needs to be re-named to not sound so mingey. I suggest "Nova", "Shield", "Omega" (Meaning End), "Bio", or anything else. Basically what Snyder said, I have a list of names: Nova, Shield, Omega, Helix, or Nomad, VAMP just sounds wierd, sounds more like what the HELIX division should be. I prefer we rename VAMP to HELIX. And rename our HELIX to NOVA or SHIELD or APEX. Something. I think we should rename VAMP to APEX. Also change HELIX to NOVA but that's not for this thread. -Support, there is honestly no need for name changes of the divisions, it may just cause more confusion at this point. Although on most servers the division set up is how you have it listed, not all servers follow that. It is not really up to me to decide, you can talk to taco about it if you'd like but to be honest, I don't find it necessary.